Slate is an English-language online current affairs, politics and culture magazine in the United States. It was created in 1996 by former New Republic editor Michael Kinsley, initially under the ownership of Microsoft as part of MSN. On 21 December 2004, it was purchased by The Washington Post Company, later renamed the Graham Holdings Company. Since 4 June 2008, Slate has been managed by The Slate Group, an online publishing entity created by the Graham Holdings Company to develop and manage web-only magazines. Slate is based in New York City, with an additional office in Washington DC. A French version (slate.fr) was launched in February 2009 by a group of four journalists, including Jean-Marie Colombani, Eric Leser, and economist Jacques Attali. Among them, the founders hold 50% in the publishing company, while The Slate Group holds 15%. In 2011, slate.fr started a separate site covering African news, Slate Afrique, with a Paris-based editorial staff. In July 2014, Julia Turner replaced David Plotz, who had been editor of Slate since 2008. Plotz had been the deputy editor to Jacob Weisberg, Slate's editor from 2002 until his designation as the Chairman and Editor-in-Chief of The Slate Group. The Washington Post Company's John Alderman is Slate's publisher. Slate (ISSN 1091-2339), which is updated daily, covers politics, arts and culture, sports, and news. According to Turner, the magazine is "not fundamentally a breaking news source," but rather aimed at helping readers to "analyze and understand and interpret the world" with witty and entertaining writing. As of mid-2015, it publishes about 1500 stories per month. Slate is known (and sometimes criticized) for adopting contrarian positions, giving rise to the term "Slate Pitches." It is ad-supported and has been available to read free of charge since 1999, but restricted access for non-US readers via a metered paywall in 2015. Slate features regular and semi-regular columns such as Explainer, Moneybox, Spectator, Transport, and Dear Prudence. Many of the articles are short (under 2,000 words) and argument-driven. Around 2010, the magazine also began running long-form journalism. Many of the longer stories are an outgrowth of the "Fresca Fellowships", so-called because former editor Plotz liked the soft drink Fresca. "The idea is that every writer and editor on staff has to spend a month or six weeks a year not doing their regular job, but instead working on a long, ambitious project of some sort," Plotz said in an interview. In the context of a 2014 reader discussion, it was stated that the magazine is perceived to have "left-liberal leanings". In 1998, Slate introduced a paywall-based business model that attracted up 20,000 subscribers but was abandoned afterwards. A similar subscription model would later be implemented by Slate's independently owned competitor, Salon.com, in April 2001. On November 30, 2005, Slate started a daily feature ”Today's Pictures”, featuring fifteen to twenty photographs from the archive at Magnum Photos that share a common theme. The column also features two flash animated ”Interactive Essays” a month. 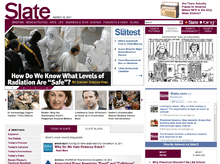 In June 2006, on its tenth anniversary, Slate unveiled a redesigned website. In 2007, it introduced Slate V, an online video magazine with content that relates to or expands upon their written articles. In 2013, the magazine was redesigned under the guidance of Design Director Vivian Selbo. In 2011, Slate was nominated for four digital National Magazine Awards and won the NMA for General Excellence. In the same year, the magazine laid off several high-profile journalists, including co-founder Jack Shafer and Timothy Noah (author of the Chatterbox column). At the time, it had around 40 full-time editorial staff. The following year, a dedicated ad sales team was created. In 2014, Slate introduced a paywall system called "Slate Plus" offering ad-free podcasts as well as some bonus materials. A year later, it had attracted 9,000 subscribers generating about $500,000 in annual revenue. In June 2015, Slate started moving all content behind a metered paywall for international readers, explaining that "our U.S.-based sales team sells primarily to domestic advertisers, many of whom only want to reach a domestic audience. ...The end result is that, outside the United States, we are not covering our costs." At the same time, it was stated that there were no plans for a domestic paywall. Since at least 2006, Slate has been known for publishing contrarian pieces arguing against commonly held views about a subject, giving rise to the #slatepitches Twitter hashtag in 2009. The Columbia Journalism Review has defined Slate pitches as "an idea that sounds wrong or counterintuitive proposed as though it were the tightest logic ever" and explained their success as follows: "Readers want to click on Slate Pitches because they want to know what a writer could possibly say that would support their logic". In 2014, Slate's editor-in-chief Julia Turner acknowledged that a reputation for counterintuitive arguments forms part of Slate's "distinctive" brand, but argued that the hashtag misrepresents the site's journalism: "We are not looking to argue that up is down and black is white for the sake of being contrarian against all logic or intellectual rigor. But journalism is more interesting when it surprises you either with the conclusions that it reaches or the ways that it reaches them." Slate has been involved in podcasts "almost from the very beginning" of the medium (according to NiemanLab), beginning to offer a podcast on July 15, 2005 that featured selected stories from the site read by Andy Bowers, who had joined Slate after leaving NPR in 2003. The site now hosts several regular podcast "gabfests", or roundtables, covering various topics. The Political Gabfest was the first, hosted by John Dickerson, Emily Bazelon and David Plotz. Later, a Culture Gabfest was added. The sports podcast, Hangup and Listen, is the most recent addition. "Slate's Spoiler Special", reviews movies for people who have already seen them. By June 2012, Slate had 19 podcasts, with its Political Gabfest and Culture Gabfest the most popular. In February 2015, they numbered around 14, receiving 6 million downloads per month. Slate podcasts have gotten longer over the years. The original Gabfest was 15 minutes; by 2012, most were about 45 minutes. They are "a profitable part of the business"; Slate charges more for advertisement in podcasts than for any of its other content. ↑ "Slate.com Site Info". Alexa Internet. Retrieved August 25, 2016. ↑ "Interview: Jacob Weisberg, Chairman, Slate Group: Breaking Out of the Beltway". CBS News. February 15, 2009. ↑ "Slate.fr: Jean-Marie Colombani à l'assaut du Web, actualité Tech & Net – Le Point" (in French). Le Point. February 10, 2009. Retrieved April 28, 2013. 1 2 3 Levy, Nicole (September 30, 2014). "Long-serving deputy Julia Turner takes the reins at Slate". Capital New York. Retrieved September 30, 2014. 1 2 "Unlimited FAQ". Slate. Retrieved July 2, 2015. ↑ "Contrarianism's end?". The Economist. October 19, 2009. 1 2 Coscarelli, Joe (October 23, 2009). "Slate's Contrarian Ways Mocked On Twitter". Mediaite. ↑ Winter, Jessica (21 May 2015). "Slate Isn't Too Liberal. But…" – via Slate. 1 2 Sawers, Paul (June 8, 2015). "Slate slides behind a metered paywall as global readers are asked to pay $5/month". VentureBeat. Retrieved July 2, 2015. 1 2 Farhi, Paul (August 24, 2011). "Slate magazine lays off Jack Shafer, Timothy Noah". The Washington Post. ISSN 0190-8286. Retrieved July 12, 2015. 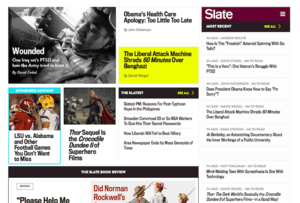 ↑ "'Slate' Gets a New Publisher". Adweek. August 27, 2012. Retrieved July 12, 2015. ↑ Bosman, Julie (March 1, 2012). "Slate to Begin a Monthly Review of Books". The New York Times. Archived from the original on February 27, 2013. Retrieved April 28, 2013. ↑ Turner, Julia (June 7, 2015). "Hello, International Reader". Slate. ISSN 1091-2339. Retrieved June 7, 2015. ↑ Goldenberg, Kira (October 16, 2014). "Stop trolling your readers". Columbia Journalism Review. Retrieved October 16, 2014. 1 2 3 4 Phelps, Andrew (June 4, 2012). "Slate doubles down on podcasts, courting niche audiences and happy advertisers". Nieman Foundation for Journalism. Retrieved April 28, 2013. 1 2 Owens, Simon (February 6, 2015). "Slate's podcast audience has tripled in a year, and its bet on audio over video continues to pay off". NiemanLab. Retrieved February 6, 2015. 1 2 Yoffe, Emily (2015-11-12). "Don't Call It Closure". Slate. ISSN 1091-2339. Retrieved 2016-07-31. ↑ Stelter, Brian (November 16, 2009). "Double X Is Folded Into Slate Magazine". The New York Times. Retrieved July 12, 2015.